I’m Sue. As a content designer at GDS, it’s my job to write content for everyone. This means I write in the simplest way to help our users do things that are often complex. To make sure the words we use are both clear and accurate, we often need input from experts in a particular area like law, policy or product. We’ve found that working together to ‘pair write’ is a good way to do this. I’ve run quite a few pair writing sessions and I’m constantly tweaking them depending on where in the country the 2 people are, and how quickly the content needs to be written. However, in all cases so far, I’ve found that this 4-step process works well and makes sure your content meets user needs. The best way to kick off is, like always, to start with user needs. 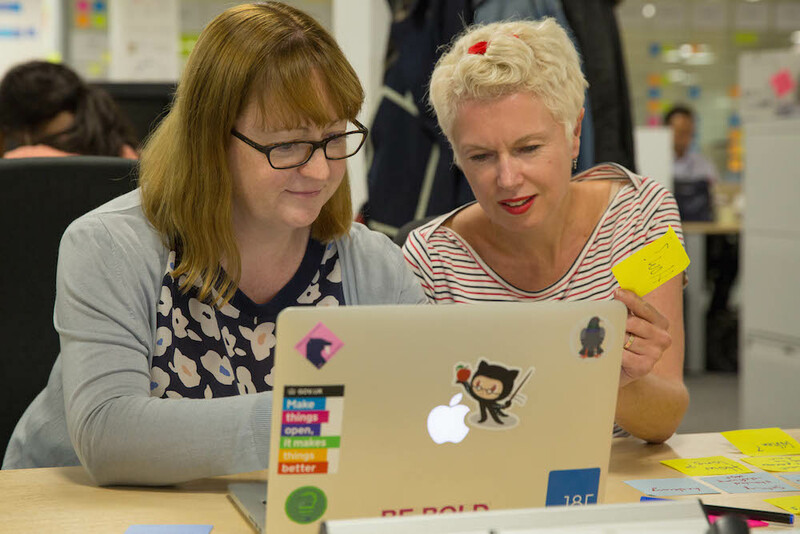 There’s a chance that the subject expert might not be familiar with a user-needs-centred approach, so it’s worth spending time focusing on what user needs are. This will help you both work with the same thing in mind. 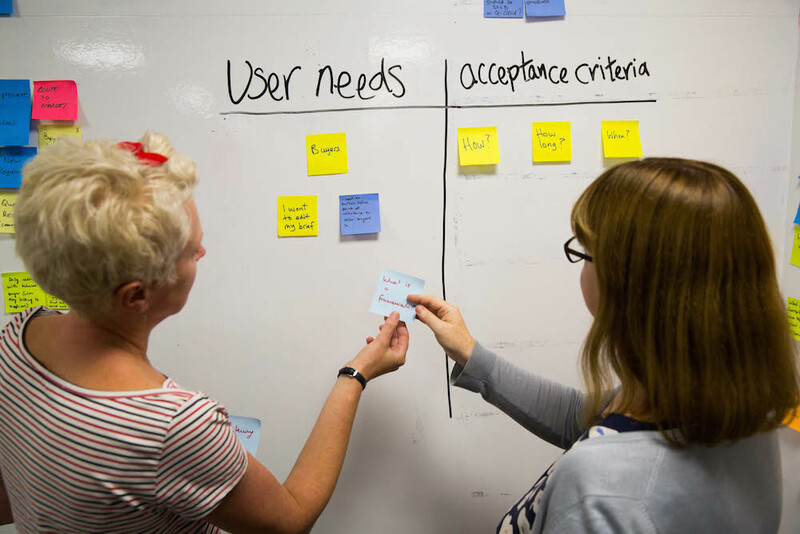 Then work out the ‘user acceptance criteria’ for the piece of content you’re going to write. These are the things that the piece of content will need to include to be useful to the user. To do this, I usually ask the pair writers to think about the main questions users will have about the thing they’re trying to do. And finally, before you start writing, the subject expert should flag if there’s any information you have to include for legal reasons. I’d recommend writing down anything you have for each of the categories and keep them in mind throughout the process. Put yourself in the user’s position and think about the questions they’re likely to have, and the order they’re likely to have them in. This will give you a starting point and an idea of a sensible order for the content. 3. Write words. Get rid of jargon. is there another way of saying that? should this part come further up? Usually, I’ve found it works well if the pair swaps who types every now and then. You’ll know you’ve finished when you’ve addressed all the user needs you wrote at the start of the session. Most of the time, the thing you produce on the day won’t be a super shiny ‘finished’ thing - you’ll need to polish and tweak afterwards. Sometimes, you’ll need experts in other areas to fill in a couple of gaps here and there. It’s really good to get input from relevant and knowledgeable people but it’s always worth giving very strict deadlines for feedback and amends. If you don’t, the polishing process can be never-ending and you risk delaying getting the content to your users. Pair writing sessions are great in person but they work equally well if you have access to collaborative software. Google Hangouts allows both people to speak on a video call and see each other’s screens. 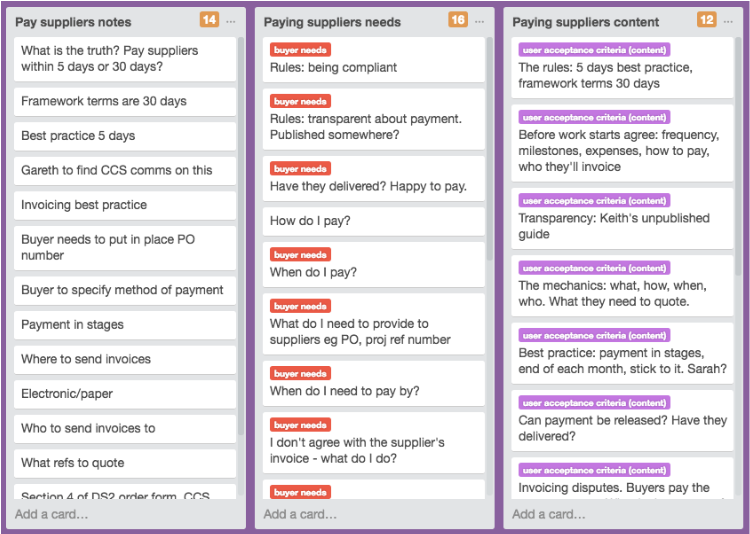 Trello lets you group and order cards in online lists, which is really useful at the start of the pair writing process when you work out user needs and acceptance criteria. When you start writing, do it in Google Docs and share the document between you. You can see each other typing in real time. Earlier in 2016, I worked on the Digital Marketplace. We launched a new way for the public sector to find what it needs to buy for its digital projects. When we launched the minimum viable product (MVP), users needed to complete some steps outside the Digital Marketplace. This meant we needed to write a collection of 17 guides, in less than 3 months, to make sure buyers knew how to do the right things at the right time. Content lead Roz Strachan explained more about how we wrote content as a team. Follow Sue on Twitter, and don't forget to sign up for email alerts. I pair with the process expert to write instructions. The process expert sits on my left side (as with the pilot of a plane). We use a projector to make screen sharing easier. We question each other's contribution as we listen, record, clarify and edit. When the process expert is happy with what we have they arrange a review of the draft instruction from others involved with the process. We jointly reconcile review comments within two weeks of making the first draft. By saying "reconcile" we accept or explain why we cannot accept the change and we do not ignore any proposed changes. The instruction is then ready for the process expert to recommend its approval by the authorized person or people.